St Nicholas Naval Cathedral stands not far from the intersection of the Griboyedov and Kryukov Canals in Nikolskaya Square. 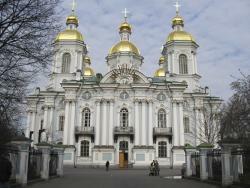 This cathedral was built between 1753 and 1762. It was created after the design of the ar­chitect Savva Chevakinsky. This structure is a master­piece of Russian baroque architecture. It is one of the best architectural ensembles of Elizabethan baroque. St Nicholas Naval Cathedral is an elegant and splen­did white and blue building with a light bell-tower which stands separately from the cathedral on the bank of the Kryukov Canal. The graceful silhouette of this bell-tow­er blends with the picturesque view of the Kryukov Ca­nal. This four-tiered bell-tower appears to soar upwards. The three tiers of the tower are decorated with columns. The fourth upper tier of the tower is a drum with a small dome. The dome of the bell-tower is crowned with a thin elegant spire. St Nicholas Naval Cathedral is one of the biggest cathe­drals in St Petersburg. It is a two-storey building with five domes. This monumental building is remarkable for its ex­pressive volumes and shapes. The cathedral has the shape of a cross. It is a traditional form for cathedrals. The cathedral is decorated with white columns. The windows and mouldings of the building are elaborate. There are cast iron railings on the balconies. The cathe­dral is graced lavishly. Actually the cathedral consists of two churches: the upper and the lower ones. The notable feature of the up­per church of the cathedral is the beautiful iconostasis. It was carved by the craftsman Ignaty Kanayev. The colonnade is embellished with a wonderful carving. It is the work of the same master. The master depicted flower garlands and foliage. There are some icons of the 18th century on the iconostasis. These icons were created by the famous masters Mina and Fedot Kolokolnikov. There are always many people in this cathedral. This wonderful cathedral is one of the most well-known and popular cathedrals in St Petersburg. During the years of persecution of the church the services were held in the cathedral. Even during the blockade of Leningrad the cathedral didn’t stop working. It was opened for all people, they could always get support here. Every day services are held in the cathedral now.